The first part of Tony Kushner's epic drama of America in the 1980s. Winner of the 1993 Pulitzer Prize for Drama. Winner of the 1993 Tony Award for Best Play. There will be two ten-minute intermissions. 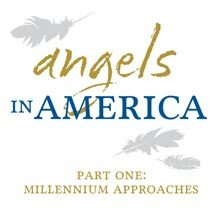 Critics reaction to "Angels In America Part One: Millenium Approaches"
*Opening night wine and cheese reception sponsored by Cabot Cheese, Edible Arrangements and West Side Wine and Spirits. CLARK BEASLEY, JR. (Belize/Mr. Lies) is thrilled to be back at Playhouse on Park, having first appeared here as Crooks in OF MICE AND MEN in 2012; T Schreiber Studios: Dia (FAUNA AND BLOOD); The ReGroup Theater: Abe (ABRAHAM'S BOSOM); The ReGroup Theater: Duffy (HOUSE OF CONNELLY); The ReGroup Theater: Bigger Thomas, (NATIVE SON); St Marks Theater: Azaguy (RAISINETTES IN THE SUNSHINE); Dixon Place Theater/NYC Fringe Festival: Hal (PIC-UP). Look for Clark in the upcoming web series BLUE WALL. Sean, thank you for always being so supportive. TIM HACKNEY (Joe Pitt) Playhouse on Park debut. National Tour: u/s Robert, Aldolpho (THE DROWSY CHAPERONE); The Hudson Guild: Ramsdell (THE WHALESHIP ESSEX). Tim is a graduate of The William Esper Studio. For Lindsay. KRISTEN HARLOW (Harper) Playhouse on Park debut. Strange Sun Theater Company: Natalie (HOT SEASON); Godlight Theater Company: The Doctor's Wife (BLINDNESS); Edinburgh Fringe Festival: Mildred (FAHRENHEIT 451); Imua! Theater Company: Briseis (THE GREEKS); New York Fringe Festival: Marie-Laure (A YELLOW BUTTERFLY CALLED SPHINX); Allentown Shakespeare in the Park: Lady Macbeth (MACBETH), Dogberry (MUCH ADO ABOUT NOTHING), Jacques (AS YOU LIKE IT), and Viola (TWELFTH NIGHT); Kristen has also been seen in many Youngblood/EST Brunches. She has an MFA in acting from Rutgers. OLIVIA HOFFMAN (The Angel) Playhouse on Park debut. Commonwealth Shakespeare Company: Ensemble/ u/s Julia (TWO GENTLEMEN OF VERONA). Powerhouse Theater Directing Lab: Joan of Arc (WHOLLY JOAN'S). Hartford Stage: Fan (A CHRISTMAS CAROL). Favorite Emerson College Credit: Cavale (COWBOY MOUTH). Olivia has a BFA in Acting from Emerson College. Massive amounts of love to her parents, sisters/brothers, and her muse, Waffle. JAMES PARENTI (Prior) Playhouse on Park debut. Dare Lab: Hamlet (MAY VIOLETS SPRING); Turn to Flesh Theatre: Cupid (CUPID AND PSYCHE), Perseus (TURN TO FLESH); Hip to Hip: Navarre (LOVE'S LABOUR'S LOST), Ferdinand (THE TEMPEST); Bare Shakespeare: Bertram (ALL'S WELL THAT ENDS WELL); Block and Tackle: Walt Whitman (THE BODY ELECTRIC); The Other Mirror: Leon (MADAME BOVARY). BFA in Acting, Marymount Manhattan College; www.jparenti.com can tell you more. Love K all day. JIM SHANKMAN* (Roy Cohn) Playhouse on the Park debut. New York International Fringe Festival: Izzy/Danny (KISS YOUR BRUTAL HANDS); New Jersey Rep: Josh (JERICHO), Sidney Krebs (SICK); Florida Stage: Arthur Stein (END DAYS), Carl (OPUS); Dorset Theatre Festival: Ben Hecht (MOONLIGHT AND MAGNOLIAS), Morris Kaden (AS BEES IN HONEY DROWN), Alex Gal (ROUGH CROSSING); Rainbow Theatre: Moe Axelrod (AWAKE AND SING); Coyote Theatre: Teach (AMERICAN BUFFALO), Charlie Fox (SPEED-THE-PLOW); Syracuse Stage: Harry Berlin (LUV). *Appears through the courtesy of Actors' Equity Association, the Union of Professional Actors and Stage Managers in the United States.